Astronomie - Skull-shaped death comet asteroid will fly by Earth after Halloween The eerie space rock will zoom past Earth on Nov. 11. Raumfahrt - On Thursday 27 September Nammo successfully completed the first launch of Nucleus, a sounding rocket powered by its new hybrid rocket motor. 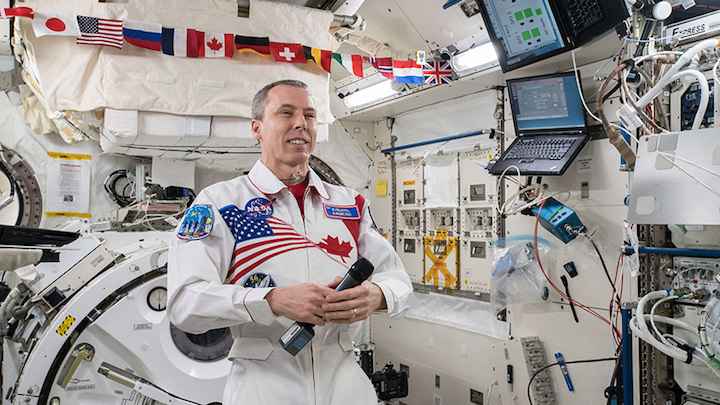 Commander Drew Feustel participates in an event inside Japan’s Kibo laboratory module aboard the International Space Station. The Expedition 56 crew aboard the International Space Station awaits the arrival of new science experiments and crew supplies Thursday morning. One week later, three crew members will return to Earth after 197 days in space. Japan’s H-II Transfer Vehicle-7 (HTV-7), also known as the “Kounotori,” is nearing the station and headed for a Thursday morning capture at 8 a.m. EDT. The HTV-7 is loaded with over five tons of science and supplies, including the new Life Sciences Gloveboxand a half dozen lithium-ion batteries to upgrade the station’s power systems. NASA TV begins its live coverage of the capture activities Thursday at 6:30 a.m.
NASA astronauts Drew Feustel and Serena Auñón-Chancellor are finalizing several weeks of computer training today to capture the HTV-7. Feustel will be inside the cupola and command the Canadarm2 robotic arm to capture the Kounotori Thursday morning. Auñón-Chancellor will back up Feustel and monitor the Kounotori’s approach and rendezvous. Meanwhile, Feustel and two other Expedition 56 crewmates are scheduled to depart the orbital laboratory on Oct. 4 just a week after the Kounotori arrives. Soyuz Commander Oleg Artemyev will lead the flight home inside the Soyuz MS-08 spacecraft flanked by Feustel and NASA astronaut Ricky Arnold. The three departing crewmates have been packing up crew supplies, station hardware and science experiments to take back to Earth. The trio also practiced their Soyuz descent maneuvers and prepared themselves for the effects of returning to gravity. . Once the trio departs, Expedition 57 officially begins. NASA astronaut Nick Hague and Soyuz Commander Alexey Ovchininwill launch and arrive one week later. During Expedition 57, the crew will conduct a set of spacewalks to install the new lithium-ion batteries delivered to the station on HTV-7.